Fulton — David Young wore a red apron and Steve Harding wore a white apron as the two stood near the barbecue pit at Fulton VFW Post 2657 on Monday afternoon. Harding opened the industrial barbecue pit and used kitchen tongs to turn over brats and hamburgers. The Fulton VFW held a Labor Day Picnic from 1 -4 p.m. on Monday. The annual event is always open to the public. Non-members can attend or volunteer at post events. “It takes a lot of volunteers. It’s a group effort,” he said. Young said he encourages everyone to attend the VFW Post’s events. Jim and Robbi Avra attend the Labor Day barbecue every year. Jim Avra is a veteran. Robbi Avra said they come to visit with others and to support a good cause. “We gotta support the veterans,” Robbi Avra said. 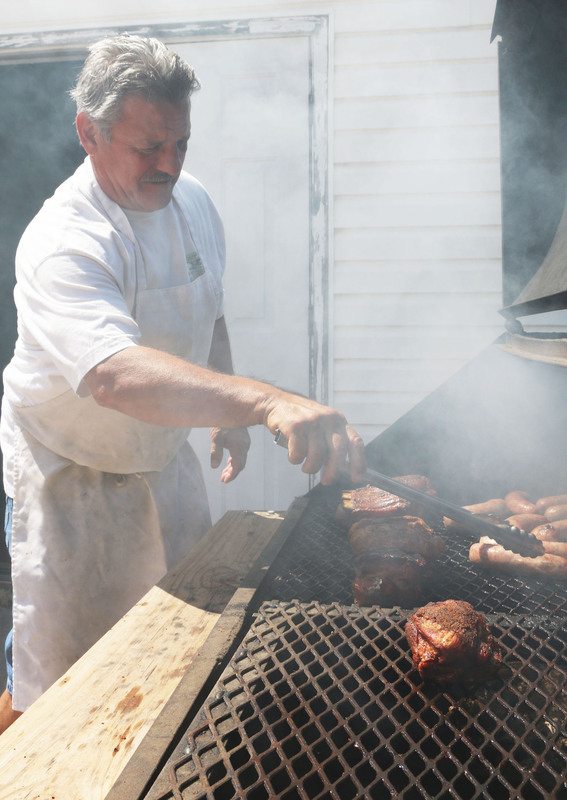 At the barbecue, the VFW served brats, hamburgers, hot dogs and sides for a $5 donation. All proceeds from the post’s events benefit veterans. The group often gives funds to the Missouri Veterans Home in Mexico, Missouri. Fulton VFW Post 2657 holds several events throughout the year, with all proceeds benefitting veterans. Harding said their events usually raise between $800 and $1500. Harding has been a member of the VFW for five years. He said people do not always understand that VFW post events are open to everyone, not just members. Up next for the VFW Post, the Fulton VFW Men’s Auxiliary will host a Friday night meal on Sept. 12. All are welcome to attend the dinner.